Born of the International Polar Year (IPY) 2007-08, but with its vision firmly fixed on the future, the European Polar Board (EPB) is in the process of proposing and developing a number of high profile European cooperation projects in the field of polar research. In this feature, SciencePoles looks at the overall strategy, as well as the most current and far-reaching components of this package. With their heightened sensitivity to climate change, the threat posed by melting ice sheet to low-lying areas, and their increasing importance in the domains of energy and international trade, there is a growing awareness at a European Union level as to the Polar Regions' scientific and strategic importance. In fact, individual European nations have been involved in polar science and exploration for two centuries, and today remain among the leaders in the field. If you include the Russian Federation, Europe counts some 27 polar research institutes, agencies and ministries spread across 19 countries. Together, they already invest over 300 million Euros annually in polar research, and maintain a total of 25 Antarctic stations, 24 Arctic stations, 31 polar research and support vessels, and 26 polar adapted aircraft (including helicopters). This inventory is unique in this breadth and reach, and provides a huge potential for multinational European coordination and cooperation: One that has already been tapped with such large and successful European research projects as the European Project for Ice Coring in Antarctica (EPICA) (which recovered the oldest continuous climate record), and the ongoing DAMOCLES project aimed at a better understanding of climate change in the Arctic. Today, seizing on the momentum of the International Polar Year (IPY) 2007-08, the European Polar Board (EPB), (established in 1995 as the European Science Foundation's (ESF) expert committee on Science Policy in the Polar Regions), is in the process of developing a number of high profile Polar research and science support programmes that will further boost Europe's polar logistics capacity: Harmonizing infrastructure and funding, stimulating networks and partnerships, and generally enhancing critical mass and added value for European polar research. Ultimately, the intention is that these programmes will help deliver the valuable research data needed by European policy makers to make the right decisions in addressing climate change and ensuring the sustainable development of the Polar Regions in general - and the Arctic in particular. Furthermore, the programmes will lead the way to the development of an enhanced European Polar Framework which, according to the European Polar Board will "enable Europe to maximise and direct its critical mass at the Global level." Launched in Rome in November 2007 during the European Polar Research summit, INFRAPOLAR is an initiative for the effective coordination and networking of over 70 Arctic and Antarctic research stations, involving 19 European nations, plus Australia, Canada, China, Chile, Japan, South Korea, and South Africa. With an estimated cost of 15.6 million Euros, the initiative has recently been submitted for funding to the European Commission Framework 7. To be coordinated by the European Polar Board (EPB), the project will involve the launching of joint calls for proposals to enhance trans-national access for scientists and to harmonize logistical support. According to the current Chairman of the EPB, professor Carlo-Alberto Ricci, the project, "would form a major European component to implementing Arctic and Antarctic Observing Networks for climate and environmental research, and INFRAPOLAR is expected to have a broad impact on the organisation and management of Polar research infrastructures". Certainly the most ambitious European Polar Board project currently under development is the construction of what will be the most advanced polar research vessel in the world. To be named Aurora Borealis, and with a construction phase announced for 2012-13, the circa 630 million Euro vessel will be conceived as an optimized science platform from the keel up. It will allow the deployment of long, international and interdisciplinary expeditions into the central Arctic Ocean, and eventually also the Southern Ocean, during all seasons of the year. Thanks to modern propulsion systems, satellite navigation, ice management support, and the deployment of Remotely Operated Vehicles (ROV), the Aurora Borealis will be the first and only deep-sea drilling platform able to operate autonomously in frozen oceans, and thus to retrieve sedimentary paleoclimatic records from regions of the sea-floor that were previously inaccessible. Indeed, able to manoeuvre and break sea ice both forward, backward and laterally in order to stay in position during drilling operation, the vessel will be equipped with a deep drilling rig able to sample the ocean floor up to 5000 metres of water and 1000 metre penetration. This drilling capacity will enable European and other international researchers to map the geological and paleoenvirnomental histories of the Arctic Ocean, and thus to evaluate and help resolve the scientific debate about what profound changes in the Arctic are due to natural fluctuations and which ones are due to human activity. In addition, Aurora Borealis will also serve the general polar research community by providing a year-round field and marine platform to facilitate a wide spectrum of scientific investigations relating to marine ecosystems, currents, and sea-ice-atmosphere interaction. 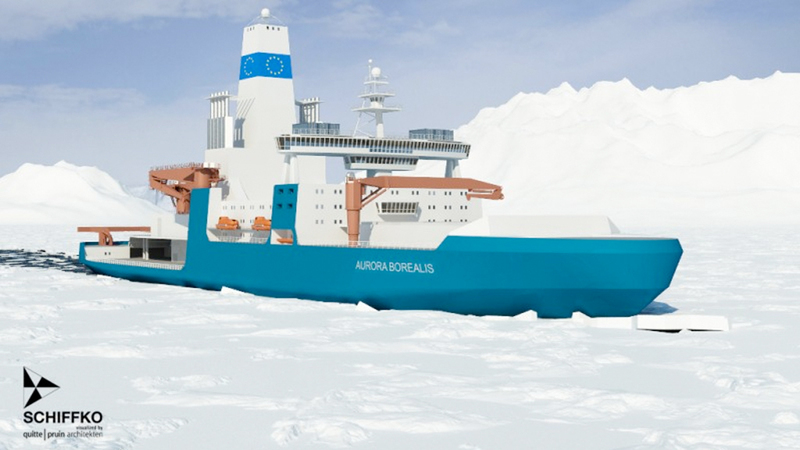 Following the successful completion of negotiations with the European Commission, 4.5 million Euros have been allocated to the European Research Icebreaker Consortium (ERICON-AB) under the European Strategy Forum on Research Infrastructure (ESFRI) roadmap, in order to put in place the strategic, scientific, legal and financial frameworks for the construction, participation and management of Aurora Borealis. Furthermore, the German Science and Humanities Counci Council (Wissenschaftsrat) has recommended the construction of the vessel, with Germany contributing at least 30% of the costs as part of an international partnership, and the German Federal ministry for Science and Education has allocating 5.2 million Euros for final technical preparatory work and engagement of the scientific community. The engineering and development work will be coordinated by the German Alfred Wegener Institute (AWI) in association with design consultants Schiffco,Aker Arctic Technology, and HSVA. However, because the project requires both the involvement of several countries, as well as the substantial build up of their polar research institutions to ensure a high quality of science and the efficient employment of the vessel, a consortium of 16 national institutions, funding agencies and companies from 10 European countries has already been formed. The consortium is coordinated by the European Science Foundation. What's more, the engagement of the European Science community is to be further promoted through workshops organized in different countries in order to discuss science plans and technical requirements. Created to encourage collaborations between polar climate scientists across Europe at a key moment in the Polar Regions' monitoring and response to climate change, PolarCLIMATE joint programme call will be launched in September 2008 by EUROPOLAR ERA-NET, a consortium of 25 ministries, funding agencies and national polar research authorities from 19 European countries, including the Russian Federation. PolarCLIMATE is an 8 million Euro funding programme designed to encourage researchers to build consortia on a broad range of polar climate related topics through the utilization of Arctic and Antarctic research facilities - including ships, aircraft, and stations. To develop collaborative research in areas of common strategic priority. Indeed, it is through this kind of initiative, and also the presence of key European and international organizations within EUROPOLAR ERA-NET that the European Polar Board hopes to open up a vast network of human and material capital, enabling the "creation of mechanisms to mobilise joint funding flows and the reciprocal access to Polar Research Infrastructures between nations". Following the extraordinary success of the European Project for Ice Coring in Antarctica (EPICA) which, from 1996 to 2006, retrieved an 3270m, 800,000 years old ice core at Dome C, high up on the East Antarctic Plateau (the world's longest uninterrupted climate record), the European ice core science community has again joined together in a major cooperative effort to continue this valuable work under the umbrella of the European Polar Board (EPB). As a scientific and logistics coordination structure, EUROPICS will cooperate and link directly with the larger International Partnership for Ice Core Science (IPICS). According to the European Polar Board, the EUROPICS structure will coordinate the European input to international ice coring initiatives in both the Greenland and the Antarctic, whilst also studying the feasibility of a larger project, closer in scale to EPICA, which would need the help in coordinating funding agencies and engagement of national polar programmes that could be achieved through the EPB-ESF structure. "There is a growing awareness at a European Union level as to the Polar Regions' scientific and strategic importance."